The Epson TM-C3400 is a reliable ink jet label printer (also capable of tickets and till rolls) with a decent speed and good reproduction. The Epson TM-C3400 works great on a range of continuous form media, including plain paper and label rolls, to create the labels or tickets that you need to help your operation run smoothly. Perfect for the printing of till receipts, address labels and more, this speedy printer can print both bar codes and QR codes for ease of communication and identification during your sales or dispatch process. Moulded in cool white plastic with smooth rounded lines, the Epson TM-C3400 output surround and support are designed in a darker grey. The printer combines push-button controls with subtle inset indicator lights for ease of use. This relatively compact label printing machine measures just ten inches wide by 10.6 inches deep by ten inches tall, giving it a functional cuboid appearance perfect for desk mounting in your consumer-facing spaces. The Epson TM-C3400 also features an auto-cutter to clip tickets and receipts at the end of each print run to help reduce the need for manual input into the label or ticket production process. The Epson TM-C3400 printer can print up to 222 inches per minute at a resolution of up to 720 x 360 dots per inch (dpi). The unit uses a three-colour, single-cartridge ink system of cyan, magenta and yellow for decent colour reproduction on continuous media outputs such as till rolls and label sticker sheets. 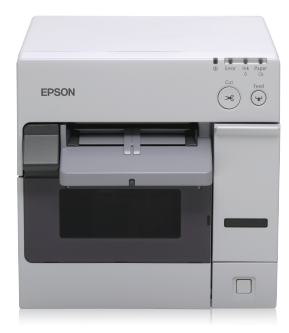 The Epson TM-C3400 connects to PCs to print from your Windows-compatible sales or dispatch software via USB and is capable of reproducing both barcode and QR code imagery to a readable quality. The USB connection needed for the Epson TM-C3400 can limit print flexibility within the workplace although there is a upgrade option to add a network connection.